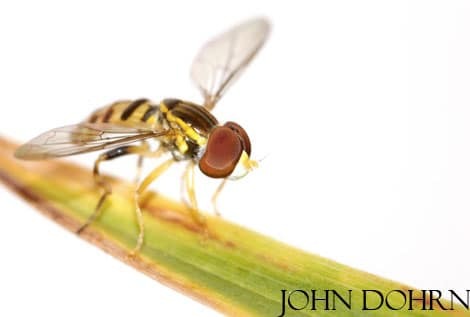 by John DohrnMacro Photography is what gets you those magnified, larger-than-life photographs. However, they start off being close to actual size on the camera’s sensor (or frame of film). When these images are enlarged – as ‘most all our pictures are – they become much larger than real life, taking us into a realm where real, everyday objects become surreal worlds . Perhaps this is where our fascination for macro photography comes from, the ability to change our every-day, ordinary world into an extraordinary one by the simple act of switching lenses. In more technical terms, macro photography involves capturing objects at close to, or greater than 1:1 magnification. For example, a 5mm disc when photographed, would produce a negative where the disc is 5mm in size. Of course, this becomes much larger when enlarged. The same happens in digital photography. Since this series of posts is solely about lenses for various kinds of photography, we’ll deal only with lenses though there are other options available in addition to the specialised macro lenses. When you look into macro lenses, you’ll find that there are some prime lenses that give you 1:1 magnification at 50mm others will give you the same at 100mm or even 200mm. The difference in the two is the minimum focusing distance, the depth of field and the perspective. While the 50mm macro will make you to go really close while photographing the subject, the Canon EF 180mm L lens allows you to stand far away (about 0.25m) while the Nikon 200mm IF-ED Lens allows you to stand .5m away while still getting 1:1. Big deal, you may say, all I’ve got to do is take a couple of steps forward and its all the same with the cheaper 50mm lens… well, not really. A longer Minimum Focus Distance means that you get the same magnification without having to disturb the creature you’ve got that lens trained on… and that makes a big difference. It also means that you will have more space to work with artifical lighting. Usually, getting a magnification greater than 2:1 (which means that the image formed on the focal plane is twice the size of the actual object! Wow!) would involve getting an extension ring set or a teleconverter or a bellows arrangement and possibly using them together. However, the Canon MP-E 65mm f/2.8 1-5X Macro Lens has a magnification range of upto 5 times actual size (5x or 5:1). Now, while I haven’t used this lens, people who have used it report that it is a difficult lens to use, but the results that you get are well worth the time and effort. No, not portraits of people’s pimples. Many, if not all of the Macro lenses listed here focus sharply upto infinity and many photographers consider them to be exceptional portrait lenses with fast focusing and high contrast. Macro photography gives you a number of options when it comes to ways in which you can get 1:1 or greater magnification. Brian Auer at Epic Edits Weblog has recently written a post on the various macro photography options that you can explore. He talks about Dedicated macro lenses, Extension tubes, reversing rings, teleconverters, close-up lenses, and how you can use some of them together. Nikon PC-E Micro Nikkor 85mm f/2.8D Manual Focus Lens (Stats) – Interesting for its ability to double both as a Perspective correction lens and a Macro Lens. You can also find out more about lenses for different kinds of photography at The Lens Resource index post. If you found this interesting and would like to view further articles in a feed reader, add our RSS feed now. Also, if you’re interested doing different things with your photography, look at our Photo Projects series. 1, about the flash: where can I get such a flash where the flash marks land in the pupil as in the photo. Thanks for stopping by BeyondPhototips. Aperture (f/2.0, f/2.8, etc) makes a huge difference, as does focal length. They both impact the depth of field (area in focus). Small f numbers and long focal lengths give you small depth of field (less area around the plane of focus is sharp) and large fnumbers (f/22, f/26 etc.) and shorter focal lengths give you greater depth of field.